It is late summer in the year 1270. Although the Simon de Montfort rebellion is over, the smell of death still hangs over the land. In the small priory of Tyndal, the monks and nuns of the Order of Fontevraud long for a return to routine. Their hopes are dashed, however, when the young and inexperienced Eleanor of Wynethorpe is appointed their new prioress. Only a day after her arrival, a brutally murdered monk is found in the cloister gardens, and Brother Thomas, a young priest with a troubled past, arrives to bring her a more personal grief. Now Eleanor must not only struggle to gain the respect of her terrified and resentful flock but also cope with violence, lust, and greed. "...gripping, with an excellent plot and wonderfully realized characters. I picked it up on a long journey and could not put it down. Wonderful read." "Some books evoke discussion, some create delight in re-reading, some inspire a search for further knowledge. 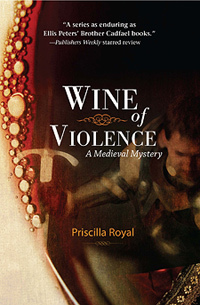 Wine of Violence does it all."